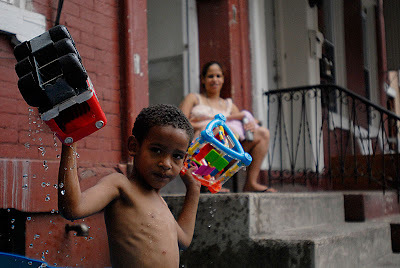 Nearly since I started shooting in Reading, I decided I wanted to do an essay called something like "views from the stoop" where I take photograph of what happens in front of residents' stoops during the summertime. 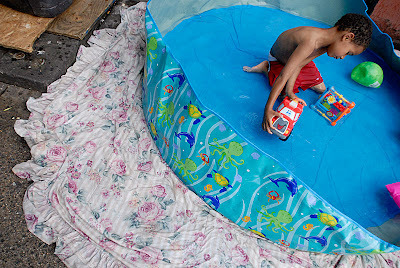 I've been a bit cowardly when it comes to following through, but today when I saw this kid in his baby pool, I knew I had to start now. I hope this experience will give me more confidence to continue the project. I think it has. The first one is great. Possibly even worth sending as a follow up to all the places you sent portfolios. Get some more photos at this level and you'll have a kickass body of work. Yeah, the top one is really the best of the bunch. 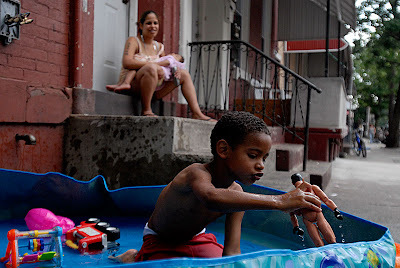 We'd probably think of those pools in our backyards with grass, but it shows a lot that the kid is having fun just the same on the concrete by the street and the mom is taking joy in it. Insightful photo. P.S. God, I hope you can recall "Stoop kid's afraid to leave his stoop. Stoop kid's afraid to leave his stoop." I'll explain it to you later if you don't get the reference.